The new and improved Pet Camp web site is up and running. It’s very cool with new videos, an updated list of all the great Pet Camp services, and even a sticky navigation bar! Yup that’s what happens when you code after eating a PB&J sandwich. But with every new web page there’s all sorts of folks proofing it and double checking all the links. Well some comedian decided to have a little fun and hid the phrase “Splash for President” somewhere in the web site (given your other options she’s a pretty good choice). 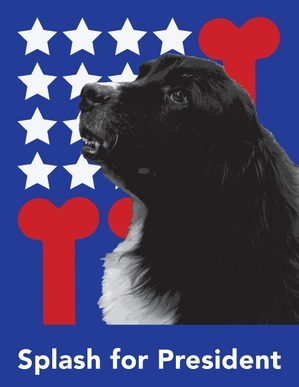 If you’re checking out the new page and come across “Splash for President” take a screen shot and email it to us at havingfun@PetCamp.com before September 6th and we’ll email you a gift certificate for a free VIP good anytime between September 15th and November 15th. Sorry, only 1 submission per camper. Thanks for helping us proof read our new page! Oh and yes, Splash did approve this message.